Infinix Hot Note Phones are some of the most important Infinix smartphones. They are similar in many ways as they have several features in common. Actually, Infinix Hot Note 2 is better than Infinix Hot Note only on screen size (6 inches instead of 5.5 inches), rear camera (13MP instead of 8 MP), and battery capacity (4040mAh instead of 4000mAh). The two phones also share one thing in common, the Infinix Flash Charging technology. But there are times when the Infinix Hot Note or the Infinix Hot Note 2 refuse to charge under the Infinix Flash Charging tech, no matter how hard you try. Having used both the Infinix Hot Note and the Infinix Hot Note 2 smartphones since late last year, I have identified three reasons why an Infinix Hot Note phone may not charge under the Infinix Flash Charging tech. The reasons are: faulty phone charging system, faulty charger, and faulty USB cable. After using the Infinix Hot Note for about two months the phone decided not to charge on the Flash Charging mode but only on the standard charging mode. I tried to google to find the cause of the problem and one of the suggestions I found was that probably my USB cable was faulty. To verify, I decided to plug the same phone using the same cable on my laptop. The laptop was unable to identify that there was a new device plugged to it, but the laptop was charging the phone albeit slowly. Infinix Hot Note phone not charging on Infinix Flash Charging mode ought not to be a problem if the standard charging mode could still work normally as on any other normal phone. The problem with Infinix Hot Note phones is that when the Flash Charging mode is not working, the the phone may never charge at all. Take this scenario for instance – the charge on your Infinix Hot Note phone has dropped to 9%. You put it on your Infinix dual capacity charger, but since the Flash Charging option is not working, the phone starts charging on the standard mode. However, after thirty minutes on charge, the battery capacity hasn’t increased to let’s say 22% but has dropped to 8% – that’s the problem of charging an Infinix Hot Note phone with an Infinix Flash Charging charger when the Flash Charging option is not working. So, when your Infinix Hot Note phone is not charging, the first thing you should check is the USB cable by trying a different capable. If a new USB cable functions properly, then you are problem has been solved otherwise move to problem two below. Since October last year I have owned two Infinix Hot Note phones and three Infinix Hot Note chargers. Two of the chargers are no longer working where one is completely off. The other one cannot deliver the Infinix Flash Charging option. 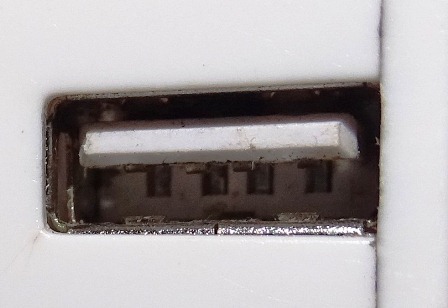 The one that cannot flash charge has its output male USB connector loose (see image below). The looseness of the connector however has not hampered the standard charging but that is not consoling as the standard charging is worse than not charging. Shortly before the rightful owner of the Infinix Hot Note snatched the phone from me, I had taken the phone to a phone repairer for the fundi to check out why my phone was not flash charging. After diagnosis the fundi found out that power was not flowing properly through the charging system (a system that includes the charging system and the mouthpiece) and according to his recommendations, I had to replace the entire system for Shs 1500. I did. After replacing the charging system my phone went back to charging normally with the Infinix Flash Charging technology. The other associated problems that included the battery running out faster than usual disappeared, and I was able to use the phone as if it were new before a thief snatched it from me roughly two weeks after repair. If therefore you are experiencing issues with your Infinix Hot Note smartphone, then it is important to diagnose the problem by first checking out whether the USB cable is still in proper working condition, whether the charger itself needs reinforcement, and whether you need to replace the entire charging system.